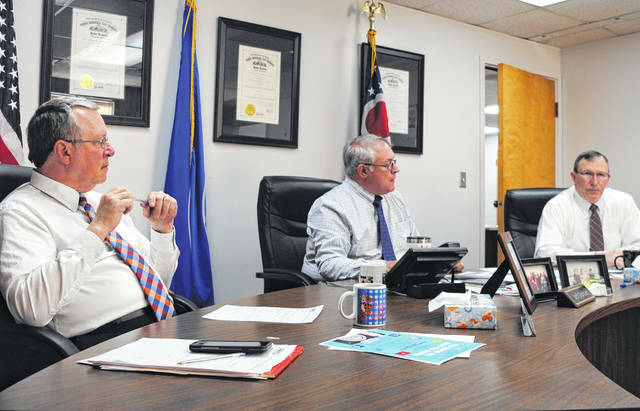 Shown from left are Highland County commissioners Gary Abernathy, Jeff Duncan and Terry Britton at the commissioners office Wednesday morning. Highland County’s coffers may see more than $900,000 in yearly revenue from a special fee on two solar energy projects planned for Southern Highland County, with more revenue expected from a similar payment that will be distributed to local school districts, levies, the county and any other entities that collect property taxes. County commissioners on Wednesday approved two resolutions establishing annual service payments in lieu of taxes for the two solar farms, charging both energy companies $9,000 per megawatt per year — $7,000 of which will be divided between all entities that receive property taxes, and $2,000 of which will flow directly into the county’s general fund. The yearly revenue from the $7,000-per-megawatt service payment will total $3.15 million prior to distribution. The yearly revenue generated by the $2,000-per-megawatt service payment tops a prior loss of $807,000 per year in county revenue after a change in federal law prohibited the county from collecting sales taxes from Medicaid-funded managed care organizations. Last year, the state gave one-time payouts to counties affected by the mandate to cushion the financial wound, but there was no long-term aid offered. On Wednesday, the commissioners paved the way for the county, local school districts and other entities that collect property tax to reap the benefits of having two massive solar farms here. Commissioners approved the service fees following an executive session with representatives from Hecate Energy Highland, LLC, which is developing a 300-megawatt facility between Mowrystown and Buford. Also present during the session were county Auditor Bill Fawley and county Engineer Dean Otworth. Another 150-megawatt facility, being constructed by Willowbrook Solar LLC, will be located two miles east of Mowrystown in Concord and Whiteoak townships, officials have said. Commissioners also approved a resolution creating an “alternative energy zone” in the areas where the projects will be located. Both projects are still pending final regulatory approval at the state level, Commissioner Gary Abernathy said after the meeting. During the meeting, Abernathy described conversation and negotiation with solar representatives as “productive” and “friendly,” and thanked commission clerks Mary Remsing and Nicole Oberrecht for their assistance. In other business, commissioners later in the morning met with legal counsel to discuss ongoing issues with Mowrystown’s embattled sewer system, which has found itself deep in debt in recent years. Also Wednesday, commissioners heard from Patrick Hornschemeier of Cardinal Land Conservancy about a state agricultural department program that preserves parcels of land as farmland forever and offers stipends to participating farms. Hornschemeier attended the meeting with Greenfield-area farmer William Rowe, who is applying for the program. Hornschemeier said Rowe’s application must include a resolution of support from the commissioners, and the commissioners approved that legislation. Hornschemeier said a farm in Clinton County is the primary applicant and that Rowe is the first alternate. Even if the Clinton County farm is approved, Hornschemeier said, Rowe may win approval next year. Hornschemeier said the land is already zoned agricultural and will not be taken off the tax rolls. Commissioners also proclaimed April 2019 Sexual Assault Awareness Month and heard an update from Dara Gullette, the director of the local Alternatives to Violence Center. Gullette said the center will hold an open house at its new facility on North High Street on May 1 from noon to 5 p.m.; the center now has a sexual assault exam room and will soon host sexual assault examination training; the eighth annual Tea for Tweens, Teens and Queens is coming up May 4 — although this event includes male participants, or “Kings”; the center will participate in the city Chocolate Walk; and the board has added several new members. Commissioner Jeff Duncan said the county appreciates the center’s work in the community. Commissioners also accepted Otworth’s resignation, which was announced last week, and wished the engineer well as he takes a job with the state. In Otworth’s resignation letter, the engineer suggested Chris Fauber be named interim county engineer, describing him as a “well-qualified” and “eager” professional. Otworth said it has been an honor serving Highland County and thanked officials for their friendship, adding that he hopes to return often as part of his new job. The commissioners also approved routine contracts and financial resolutions.